It’s not often that a piece of clothing literally equals communication. Sure, we can relate different styles to certain subcultural groups and are more than proficient in reading slogans off shirts squeezed into digital squares. But to look at a glove and discern close to the entire biography of the wearer from the garment? Sounds like something scarce in a time that is marked by designers championing global collaging — and Instagram feeds, not fashion, acting as a person’s CV. We’re used to looking onto clothes, not into them. 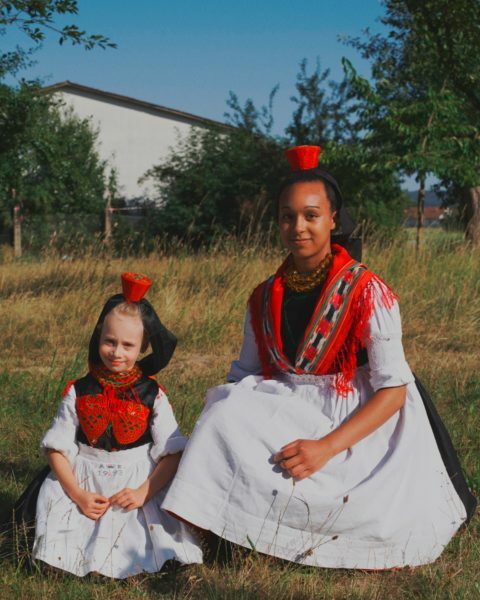 Which is precisely what the traditional costume groups INDIE and photographer Clara Nebeling met have devoted themselves to. 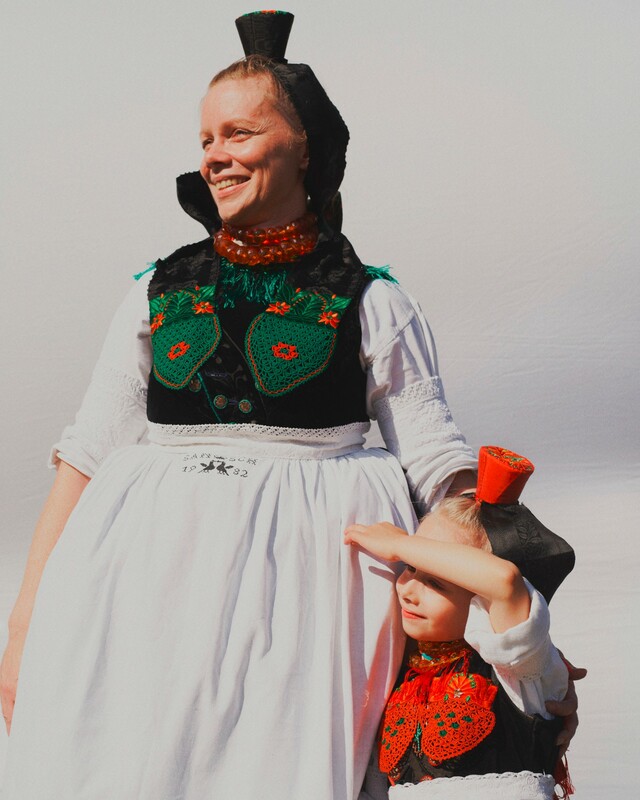 The clothing these groups are preserving — traditional costumes (“Trachten” in German) that first appeared across the country throughout the 19th century and have often been passed down over multiple generations — serve as just this kind of wearing of identity. 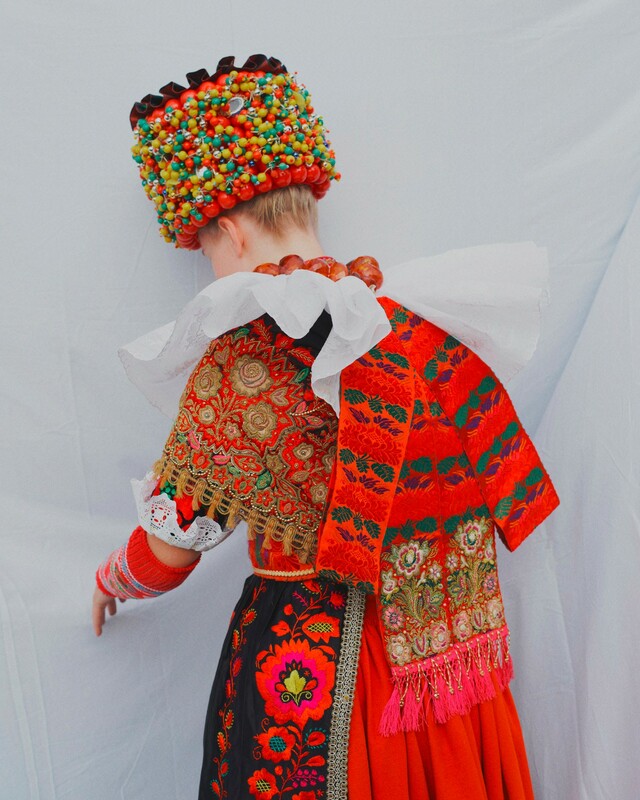 If fashion can function as a form of personal expression, traditional costume groups have mastered the art of speaking not with words but by weaving information into garments. By looking at one of these outfits, especially when they were still worn daily in rural regions until a few decades ago, one could not only read occasion, wealth, class and family status from the particular pieces, but also the wearer’s origin; a person’s roots were intertwined with their clothing, certain features and colours directly connected to the countryside as each region developed its own distinctive uniform, marked by a level of craftsmanship usually only associated with haute couture. Now mainly worn for special occasions or dance performances, the garments have become a different form of communication: in wearing them, the groups’ members are able to preserve and emphasise an essential part of their home, hidden and unknown to most people. But, as each of our interviewees was quick to emphasise, this highlighting of tradition isn’t about looking or thinking backwards — it’s about pairing the notions of community and solidarity that are so essential to the costumes with a positive and inclusive approach, especially in times that are seeing such a rapid increase in conservatism. 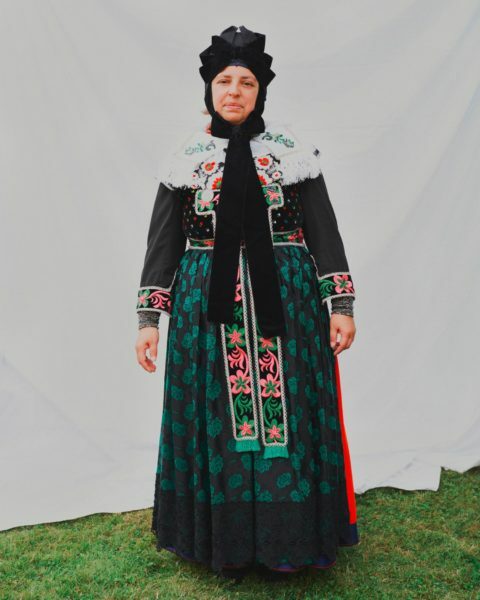 If anything, the traditional costumes make a case for the social significance of clothing. With every costume there is a distinct story hidden beneath the layers of clothing, and, most crucially, a personal engagement required — because by just hanging in the closet or stuffed into a corner, the costumes quickly become obsolete. 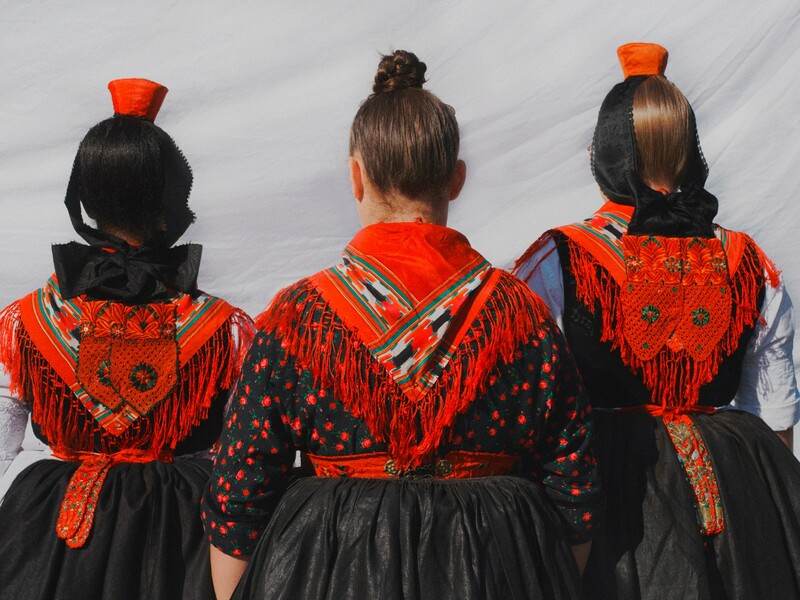 Showcasing these outfits today almost predestines their wearers to stand out, as the members of the five traditional costume groups INDIE visited — the Trachtengruppe Loshausen, Trachtengruppe Lindhorst, Trachtenverein St. Georgen, Markgräfler Trachtengruppe, and Trachtengruppe Meinsen-Warber — proudly demonstrate in this editorial. 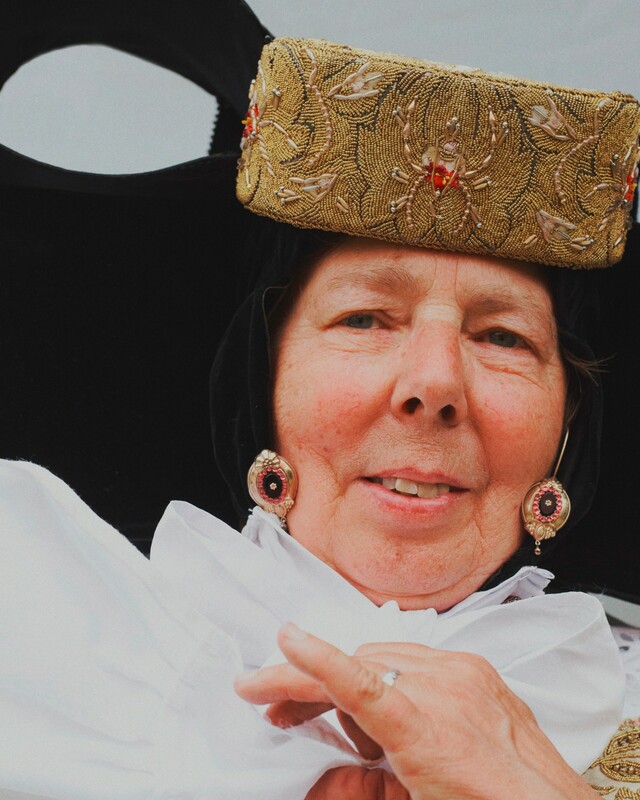 Celina Witte, a member of the Trachtengruppe Lindhorst, is wearing the festive costume, paired with a special headpiece and scarf — making the outfit not only appropriate for church, but any kind of celebration or notable occasion. At 16, Celina has been a part of the group for most of her life, describing the members as close to a second family. 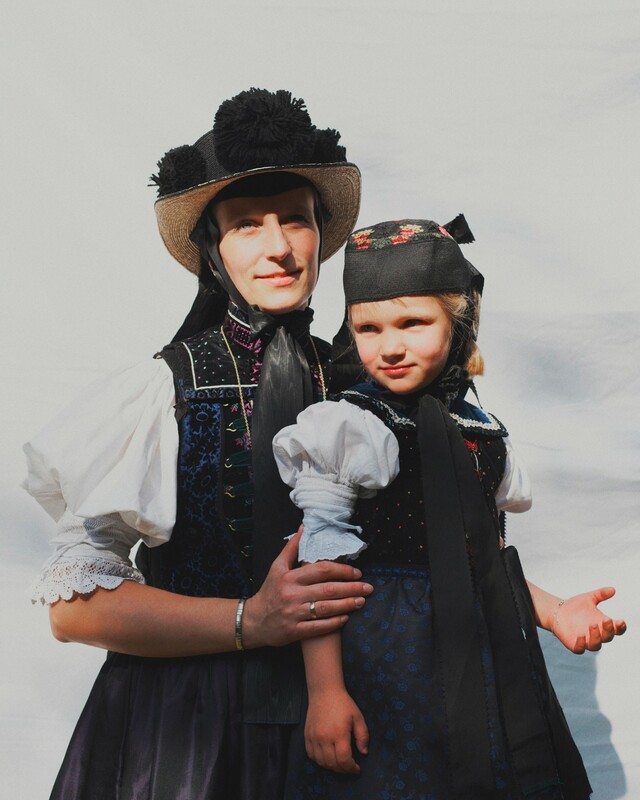 While gazing into the sun, Sandra Wagner and her daughter Luna wear the festive costumes of the Schwälmer Tracht. The green colour of her costume indicates that Sandra, who also is the secretary of the Trachtengruppe Loshausen, is married, while six year old Luna, one of the youngest members of the group, wears red, typical for girls. One of the most significant features of their costumes is the bodice, called the “Mieder”, prominently featuring their respective colours and securing the skirts. Michaela Gnielka is wearing the Friller festive costume, which is traditionally reserved for Sundays. 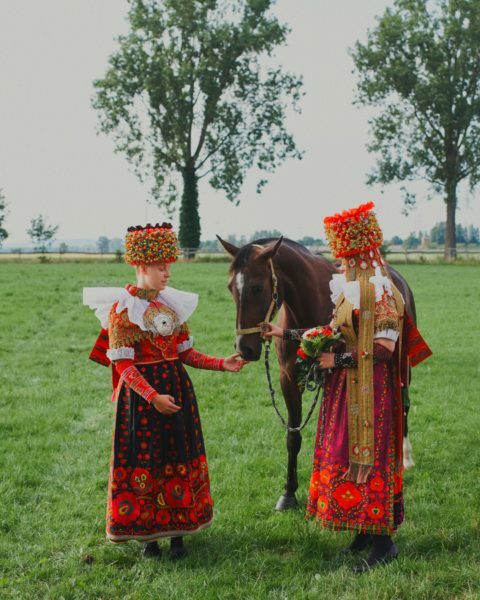 The Trachtengruppe Meinsen-Warber preserves both the Friller and the Bückeburger Tracht, which stand out thanks to their red underskirts and have lead the region to become known as “das Land der roten Röcke”— the “land of the red skirts”. 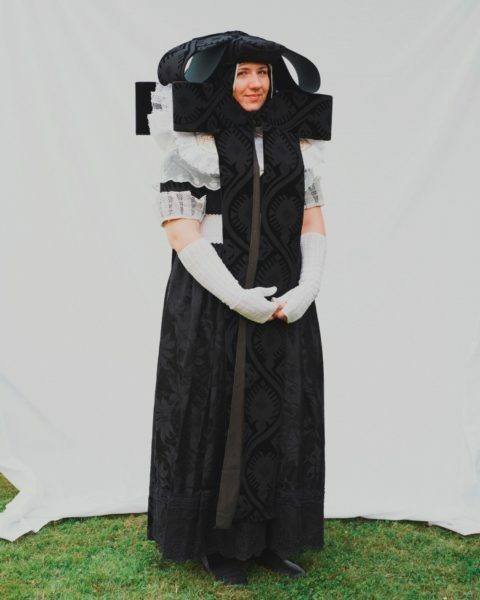 Michaela’s fellow member Katharina Behme wears the supper Tracht, which is always predominantly black and features a prominent headgear containing large ribbons constructed with cardboard. Having joined the Trachten- gruppe Meinsen-Warber 20 years ago, the now 26-year-old says its precisely this wearing of such striking tradition that she likes about the group. 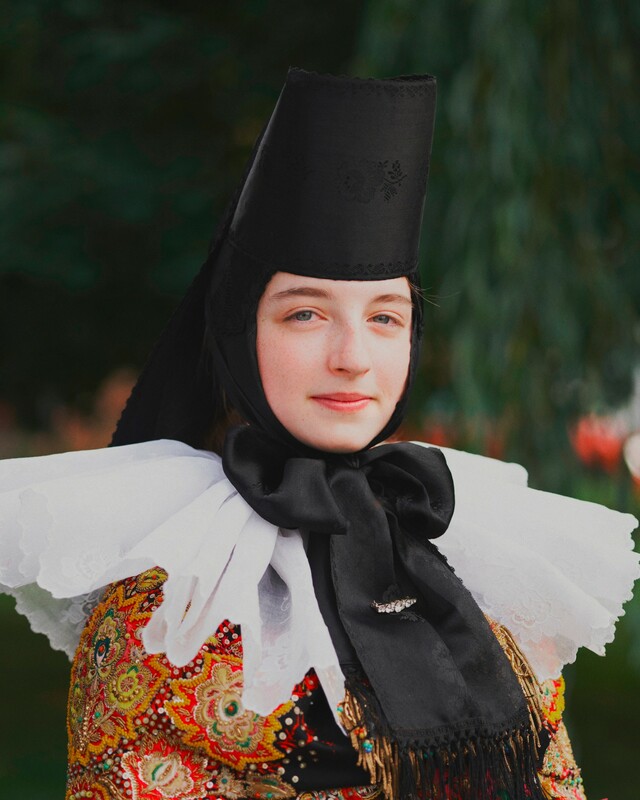 Julia Merkle, a member of the Trachtenverein St. Georgen, showcases one of the most impressive pieces of the group’s Schwarzwälder Tracht: the bridal costume featuring a 38 cm high crown and a prominent white collar, decorated with ribbons and fake flowers. As an infant, Mari Steuer, now 16, was already accompanying the Trachtengruppe Meinsen-Warber to performances. She officially joined when she was two years old, following in the steps of her whole family, who are also members of the group. 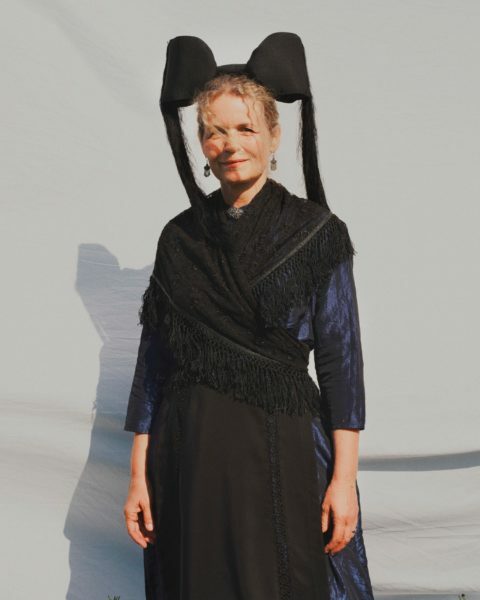 Together with her daughter Anika Hantmann, Verena Hantmann is wearing the Schwarzwälder Tracht for women and girls, their headpieces being especially important. 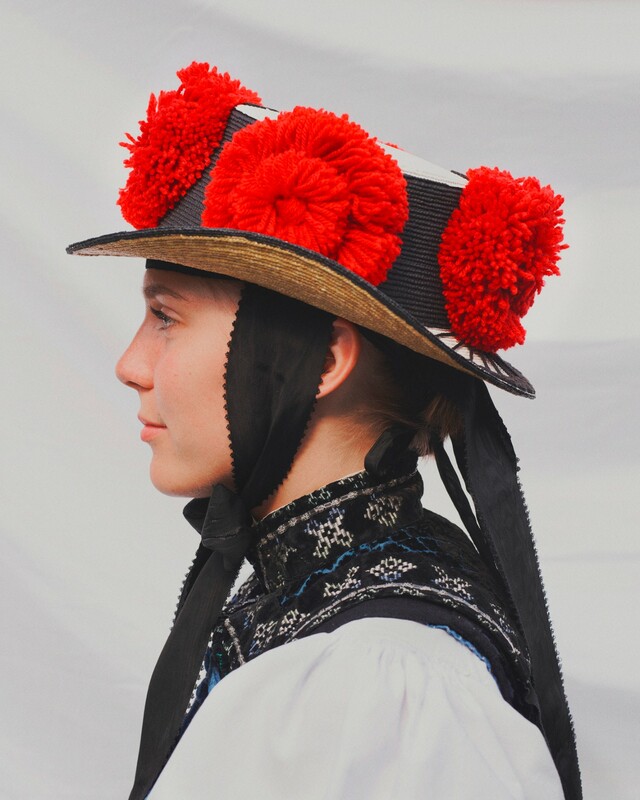 As the black rose hat is only worn by married women in the region of the Trachtenverein St. Georgen, it immediately indicates the home and family status of the wearer. Verena’s four-year-old daughter wears a skullcap, which is just as typical and made out of velvet or silk. The costume Mari is wearing is the Bückeburger confirmation costume. 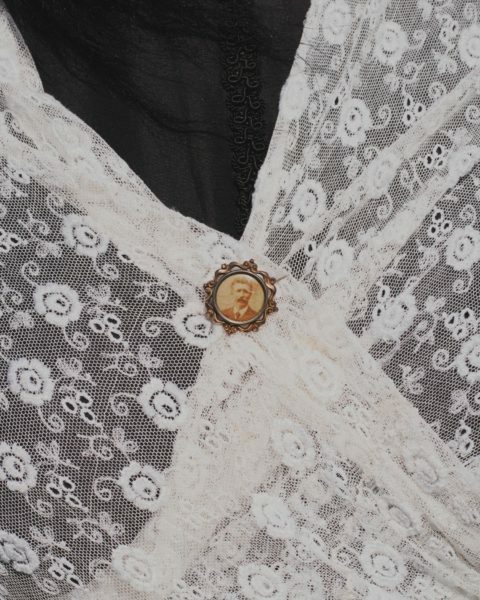 An original piece from 1900, this garment was still regularly worn to confirmations around 1910 and symbolises the entrance into adulthood. While the blue colour of the headpiece and details represents virginity, the black skirt, ribbon and blouse are already part of the costume for the supper — together with the white gloves, the outfit is supposed to cover as much skin as possible. Renate Gewers founded the Trachtengruppe Meinsen-Warber while in her teens in 1972 together with friends. Now, at 65, she is still the head of the group, and plays an active role in trying to recreate and restore parts of the costumes. Because of the very specific techniques and needlework underlying the pieces, preserving them for today is becoming increasingly difficult. Renate herself is wearing the Bückeburger festive costume, exactly as it used to be put together around 1900. One of the most prominent and technically impressive parts of the outfit is the hand embroidered headgear, called the “Flügelhaube” (“hood with wings”) and typical for costumes from this region. Contrary to the headpiece of her fellow member Verena Hartmann, the rose hat of 22-year-old Helena Merkle features not black but red flowers — symbolising that she is not married, and indicating that she is a member of the Trachtenverein St. Georgen. Sitting in the grass, Luna Wagner and Laura Laudenbach here wear the red festive costumes, standing out because of their white aprons and darker skirts. Depending on the occasion, women would wear three to five skirts for work, and eight to fourteen skirts for special occasions like a wedding — the more skirts a woman wore, the wealthier she was, as the fabrics and embroidery of the costumes were rather expensive. 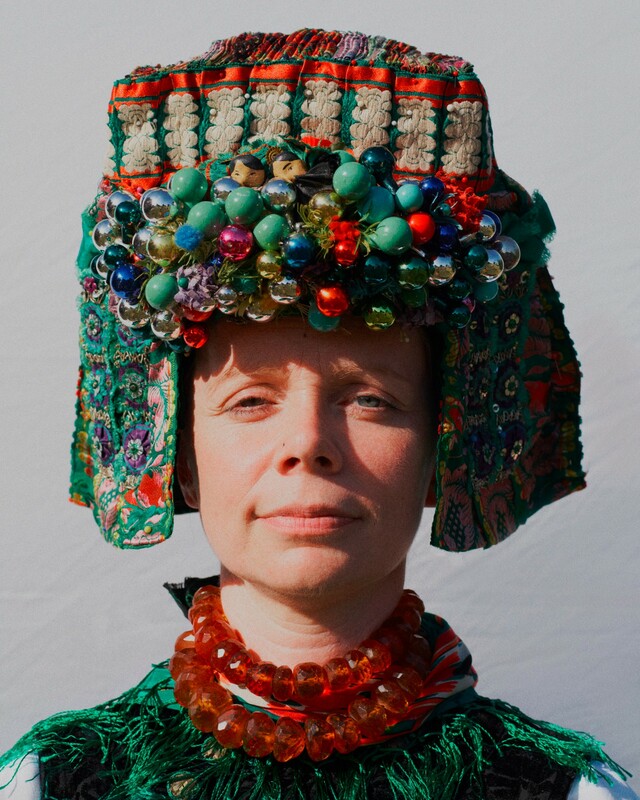 Kathrin Messerschmidt, a member of the Markgräfler Trachtengruppe, showcases a typical women’s costume of the Markgräfler Tracht, which is known for its distinct headpieces in particular. They are often called “Hörnerkappen” (“hats with horns”), because of their shape resembling a ribbon. 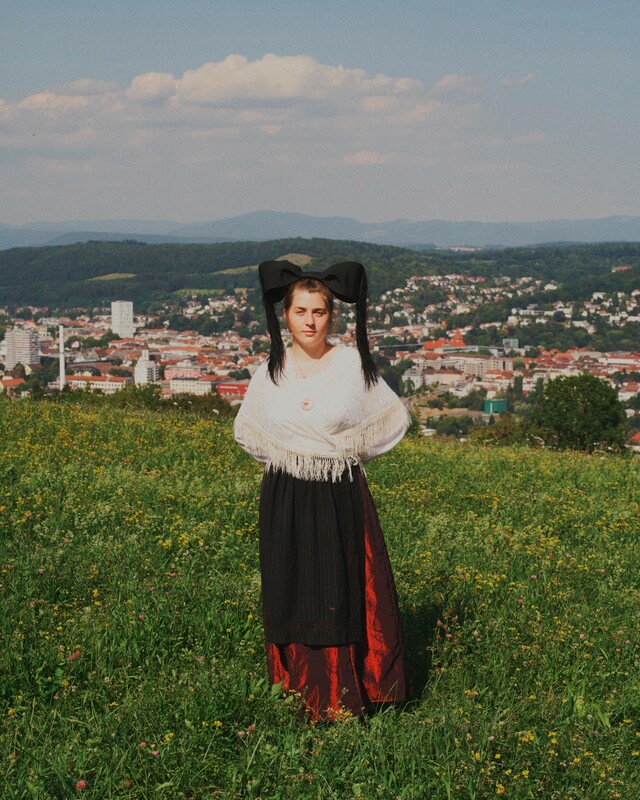 Sandra Wagner here wears the headpiece of the Schwälmer Tracht’s bride costume. 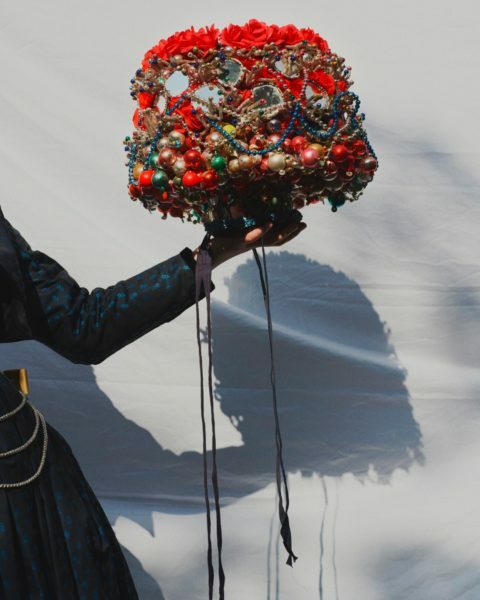 Called the “Geschappel”, it consist of six individual parts that get put together, with the centrepiece above the face featuring glass pearls, fake flowers, and little heads symbolising bride and groom. 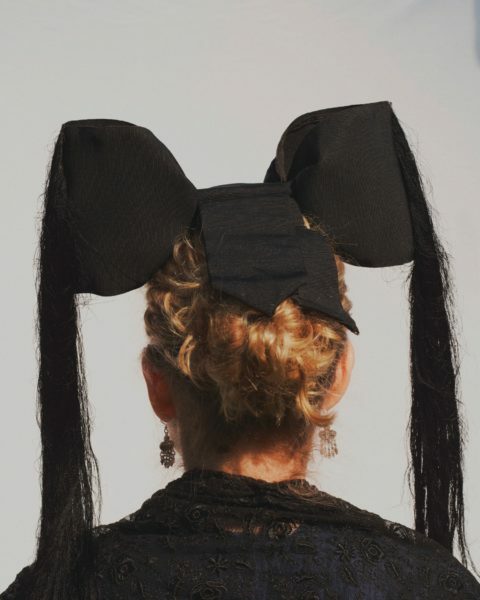 Pictured here from behind, Birka Marie Hesterberg is wearing the godmother costume of the Trachtengruppe Lindhorst. With this outfit, the 20-year-old would have been dressed appropriately to attend a christening or to be a bridesmaid. 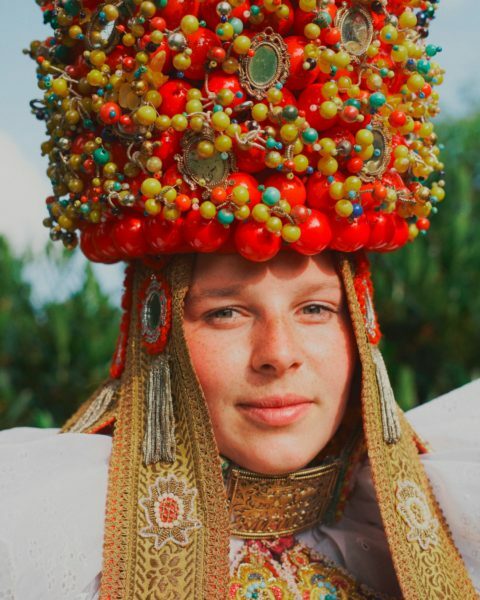 The most astonishing feature of the costume is the crown, which is made out of glass pearls and weighs around 2.5 kilos. The main garment is similar to that of the festive costume, with both containing the satin apron and a red skirt. Just like her fellow member Birka Marie Hesterberg, Pia Bönisch is wearing the characteristic red crown of the Trachtengruppe Lindhorst, which here is part of the bridal costume — entirely handmade and particularly distinctive thanks to its wide golden straps. Pictured next to each other, the costumes of Birka Marie Hesterberg and Pia Bönisch are strikingly similar save for Pia’s golden straps. Both costumes are meant to only be worn for festive occasions, a notion that is enhanced by the outfits’ especially elaborate embroidery. Still, the costumes are not impractical, and were in very frequent use throughout the last century. Twenty-year-old Sarah Rosskopf is one of the youngest members of the Markgräfler Trachtengruppe, which has an average age of 38. 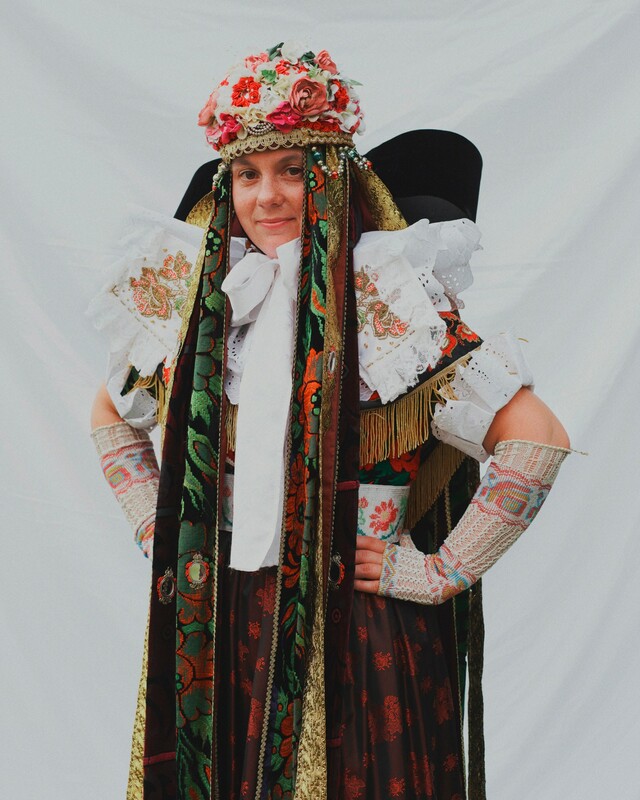 Besides her graphic design studies, Sarah is actively participating in the group and helping to preserve the tradition, here wearing the festive costume of the Markgräfler Tracht including the unique “Hörnerkappe”. 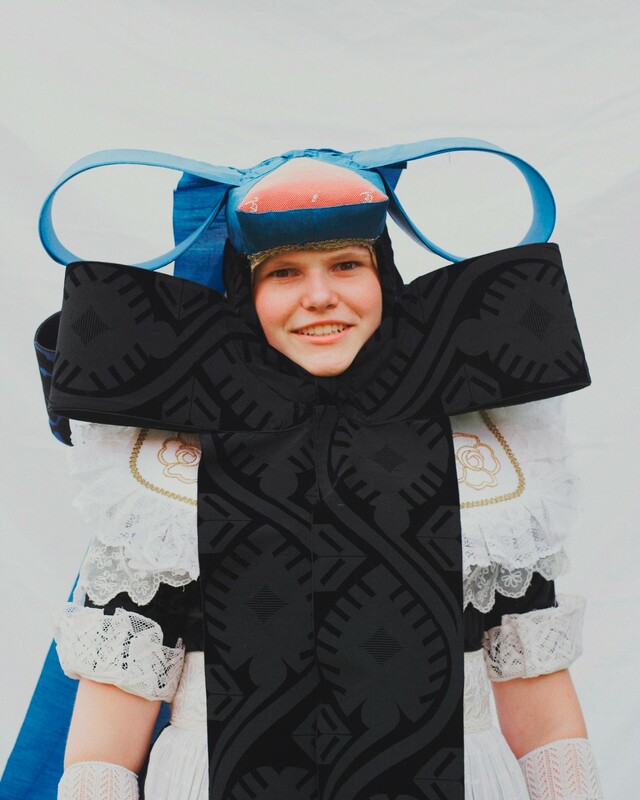 Corinna Gaus, who joined the Trachtengruppe Meinsen-Warber at the age of six, is wearing the Bückeburger bridal costume for after the church ceremony. The number of straps attached to the headpiece indicated how many skirts a woman owns — and hence how wealthy her background was. The golden straps in particular are characteristic for the bridal costume, with small mirrors sewn onto them to deflect any kind of evil. Corinna, who is 28 years old now, also runs the group’s children’s dance club, passing on her knowledge to the next generation. 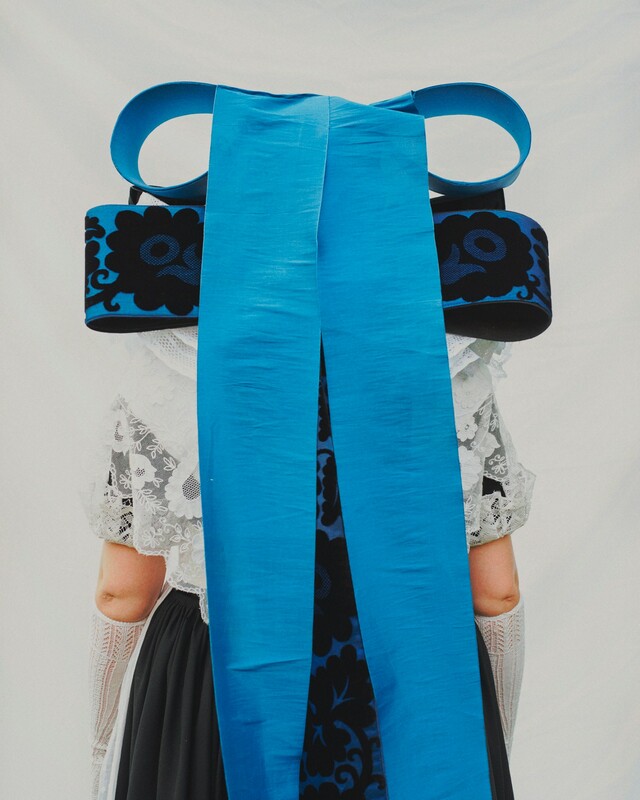 (left) Featuring delicate embroidery, this scarf worn with the Markgräfler Tracht of the Trachtenverein St. Georgen is an integral part of the costume group’s festive costume. (right) Although part of the bridal costume, this headpiece, called the “St. Georgener Schäppel”, could also be worn to other festive occasions — but not after the woman has been married. 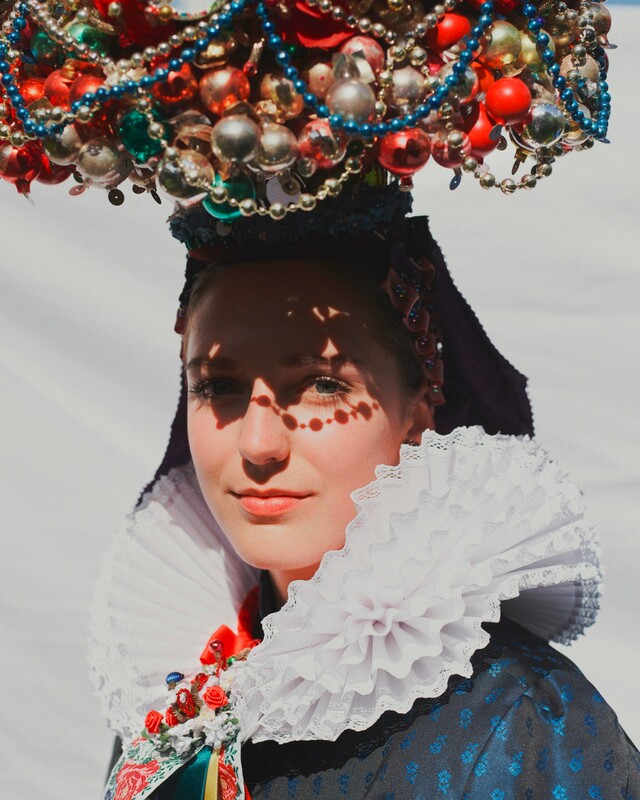 With its extensive embellishment of glass pearls, and a diameter of 35 to 40 cm, the headpiece is one of the most elaborate pieces of the Trachtenverein St. Georgen. 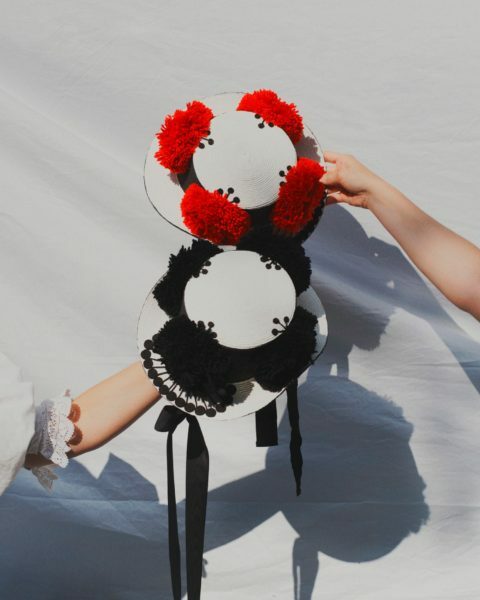 (left) Despite being a signature part of the Schwarzwälder Tracht, which the Trachtenverein St. Georgen preserves, the rose hat can only be worn by married or unmarried girls and women after the confirmation, as this symbolises their official entrance into adulthood and society. (middle) The most prominent piece of the Markgräfler Tracht, the so-called “Hörnerkappe”as we know it today, first originated around 1890, having previously only partially featured its distinct ribbon. 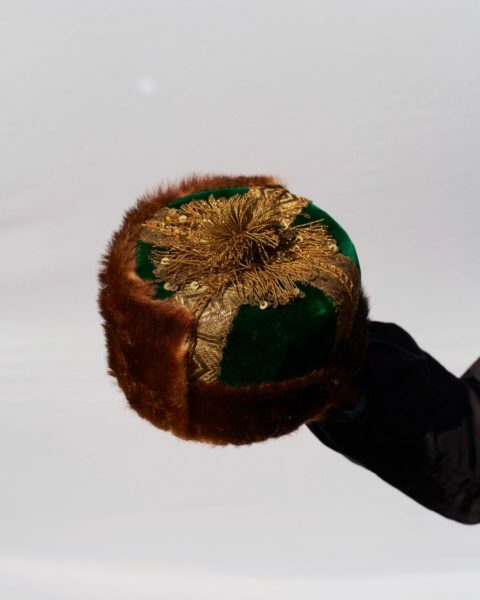 (right) Part of the Schwälmer Tracht for men, this headpiece is made out of otter fur and embroidered with golden details.